During the month of December, I usually whip out all my Gingerbread themed books and materials for therapy. It's a great theme because it doesn't highlight a specific holiday/religion, but is still festive and fun! I made this game where you try to collect the most gingerbread cookies. 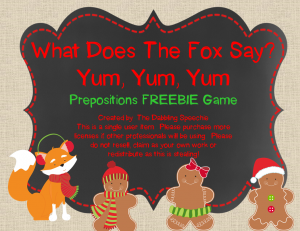 If you pick up a fox, you lose a gingerbread card because he just ate your cookie! This game can also be played in honor of the famous song "What Does The Fox Say?" Anytime a student picks up a card that has a fox, they can sing "yum, yum, yum, yum, yum, yum" to the tune of that song because the fox just ate a gingerbread cookie. This game works on building prepositional phrases in sentences, so it is a fun way to work on building utterances! Head over to my blog to grab this freebie! !